Apple HomeKit: What it does. As Amazon’s Alexa and Google Home have shown, the ability to control your home with simple commands is no longer the stuff of sci-fi or limited to programmers with extensive knowledge of home automation. And you don’t need a smart speaker as a gateway, either. Plano Texas Handyman is your home technology expert, and can transform most any home into a sophisticated Smart Home. Call Ted today at 214-507-3415 for more information or visit our website. Apple’s HomeKit is simple enough for novices who just want to say, “Siri, I’m home,” into their iPhone, before walking through their automatically unlocked door and entering a relaxing scene with just the right lighting, temperature and electronics running. In contrast to Amazon’s Echo smart home hub, Apple’s HomeKit isn’t compatible with a ton of devices. However, it could be an easy starting point for Apple fans who are just beginning to set up their smart homes. 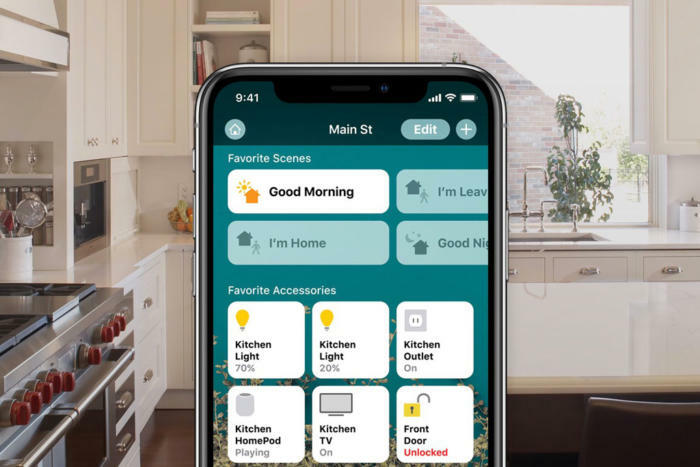 The Apple Home app, which runs on iOS 10 or later, lets you securely control any smart home device labeled as a “Works with Apple HomeKit” accessory. In the app, you can organize your accessories by room, manage multiple accessories at the same time, control your home with Siri, and more. Think of it as an app that turns your phone into a universal remote control for smart home devices that you could potentially use from anywhere in the world. While you’re home, all you need is the Apple Home app to control your Bluetooth or Wi-Fi-enabled HomeKit-compatible smart devices. To turn those devices on or off in the app, you’ll simply tap on them. Photo credit: AppleTo control your smart home devices when you’re not home, you’ll need a third- or fourth-generation Apple TV running tvOS 9 or later or an iPad running iOS 10. For added features, including the ability to give other users permission to control your devices via HomeKit, you’ll need a 4th-generation Apple TV with tvOS 10 or an iPad running iOS 10. What can I control with Apple HomeKit? HomeKit lets you turn on and off and dim your lights, adjust your thermostat, turn on and off devices connected to outlets using smart plugs or switches, lock and unlock your front door, see who’s at your door and more. Apple’s goal has been to make it easy for beginners to set up their smart homes, which can be a daunting task for novices. What brands are compatible with Apple HomeKit? Currently, far fewer devices work with Apple’s HomeKit than with other smart home hubs, but there’s a decent selection. For lighting, HomeKit works with devices such as Philips Hue white and mood lighting bulbs and lighting systems. To control temperature at home, it works with Ecobee, Honeywell and Carrier thermostats. HomeKit can also control smart plugs such as those from iHome and Elgato, the Hunter Apache Wi-Fi Ceiling Fan, and even a Wi-Fi smoke and carbon monoxide alarm from First Alert. The Apple Home app itself is free, but you’ll need to pay for the smart devices you’ll set up if you don’t already own them. On the less expensive side, a single iHome iSP5 Control Smart Plug costs $49, and on the other end of the spectrum, an Ecobee3 Smart Wi-Fi Thermostat costs $249.95. Depending on how big your home is and whether you want to control your lights, temperature, locks, security cameras and other devices, you could easily break the $1,000 mark. Plus, you’ll need an Apple TV or iPad if you want to be able to control your smart home remotely. How does HomeKit work with Siri, and what can I control with my voice?